Nebraska-based food company ConAgra Foods has launched a new addition to the Orville Redenbacher’s line of popcorn. The new popcorn variety is gourmet and is called Orville Redenbacher’s Flavors. ConAgra is excited to introduce this new product to the market because it will allow consumers to customize the flavor of their popcorn snack. The flavor gives a new twist to America’s favorite snack, popcorn. Orville Redenbacher’s Flavors are individually wrapped bags of microwaveable popcorn. This comes with a separate packet of seasoning that can be sprinkled on the popcorn, if desired. The separate packet of seasoning will allow consumers to control the amount of flavor they want to have on their popcorn. To prepare this snack, just pop it in the microwave oven and follow the instructions on the package. Sprinkle enough seasoning over the cooked popcorn, close the bag and shake it until the seasoning has been distributed evenly. You can then enjoy this fluffy, flavorful and delicious snack. Also, because popcorn is a very good source of fiber (since it is made from whole grain), it is a snack that every one in the family can enjoy. In fact, Orville Redenbacher’s Flavors would be a recommended snack for people of all ages, because not only is it fiber-rich, you can also customize it to your own preferred taste. 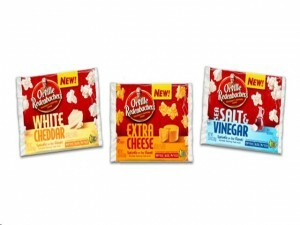 Varieties for this new popcorn include extra cheese, white cheddar, and sea salt & vinegar. This new product is already available in retail stores all over the country. Suggested price for each single, individually wrapped bag is from $1.19-$1.29. Each bag has a net weight of 3.24 ounces.